Vintage ONEIDA COMMUNITY silverplate salt & pepper shaker set in the HENLEY pattern. (c. 1930's) This nice silverplate salt & pepper set features a floral border along the base and along the neck of the salt & pepper shaker. Heavy silverplate finish. The Oneida silverplate pepper shaker has one tiny flaw - the tip of the finial is missing. 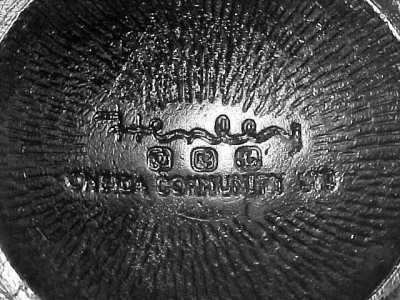 The Oneida silverplate salt shaker has a moderate amount of corrosion on the inside from the owner leaving corrosive salt stored inside and the salt shaker also has one tiny dent as shown in the photo. This 1930's Oneida Community Henley pattern silverplate salt & pepper set would make a nice addition to your breakfast table. 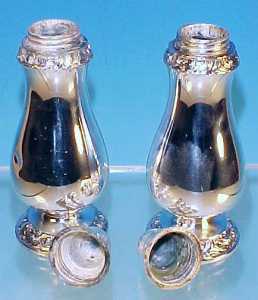 The silverplate salt shaker measures 5" tall, 2" in diameter, the base measures 1.75" in diameter and it weighs 6.9 ounces. 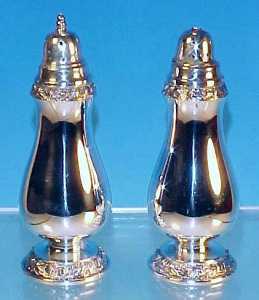 The matching silverplate pepper shaker measures 4-5/8" tall, 2" in diameter, the base measures 1.75" in diameter and it weighs 7.5 ounces. Both the salt & pepper shaker are marked on the base with HENLEY, ONEIDA COMMUNITY.